Greetings friends and fellow crafters. 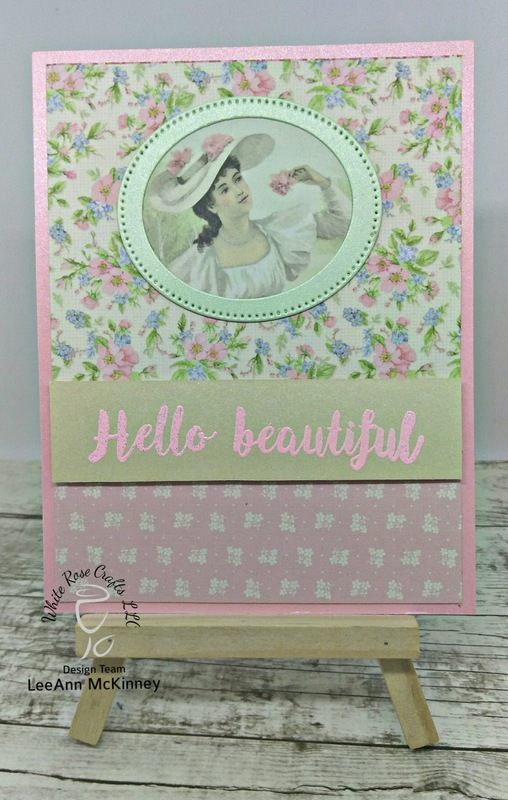 LeeAnn here with the last project I made with the White Rose Crafts Limited Edition Kit. I used 2 pattern papers from the kit to form the background along with a cut from the Natural pearlized paper. I stamped in Versamark and heat embossed using Pink embossing powder. I used an oval die and cut a frame from the Mint pearlized paper to surround the image I cut from one of the cut apart panels. My entire panel is adhered using fun foam on the pink pearlized paper. Buy this kit and subscribe to the next two and save $34.38. You will receive 3 kits for the cost of $74.99... Special.